Intervju med Bruce av Jay Nanda för ”San Antonio Metal Music Examiner”. 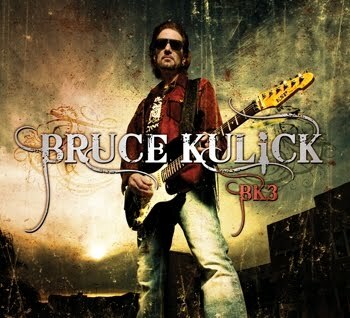 Fact is, Kulick has been the guitarist with some of rock’s biggest artists for 30-plus years, most notably from 1984-96 with KISS. He is currently enjoying his ninth year with Grand Funk Railroad (”We’re an American Band,” ”Some Kind of Wonderful”), which is celebrating its 40th anniversary in part by co-headlining the 2nd annual Rock ’N’ Roll San Antonio Marathon and Half-Marathon on Sunday, Nov. 15 at 8 p.m. at the Alamodome with Los Lonely Boys. How does playing with Grand Funk Railroad compare to your time with the others? KISS and Grand Funk are obviously two different animals, but I take performing and playing in a band very seriously. I’m very blessed to play my intstrument and make a living. With KISS, there’s a pecking order with Gene (Simmons) and Paul (Stanley), and deservedly so, with their command of the stage, whereas I was just supposed to take care of my guitar parts. With Grand Funk, I get to command the entire stage, I have a solo every song. I think the KISS fans that catch a Grand Funk song are surprised to see my role. My role is always to do my best on the guitar. But again, with KISS, especially live, it was ’Let Gene and Paul do their thing on stage, and I’ll do my guitar.’ There’s not really one better than the other, they’re just different. When was the last time you played in San Antonio, and do you have any special memories? Wow, you know in KISS, we played there in the early ’90s. Actually, it was shortly after the earthquake in L.A. in ’94. We did a few radio shows that year, and I had lost a lot of antique pieces (in the earthquake). And apparently near where we played in San Antonio, there was a cool antique store, and I was able to replace some of those things. The city has a lot of cool European vibe, and I like the Texas area in general. But I was so happy to go home with my antique booty. I remember catching one of those ’94 radio shows in Villa Park, Il. I still have that bumper sticker on my old car. I think I still have one on one of my guitars. I know you’re headed to Australia in December to promote your third solo album BK3 and that you’ve released a three-song EP from it on your Web site. What can you reveal about your latest solo effort, when will it be released, and will the tour come to the States? Yeah, I mean every day, I want this album to have a proper worldwide distribution instead of ’Oh, you can buy it on my Web site.’ It’ll still be available on my Web site, but I think things are geting finalized this week actually with my lawyer. We’ve released three songs on the site and on iTunes. I still don’t have the release date of the full record, but it should be late January or early February. A lot of the info about it is on my Web site. I have Gene and his son Nick on it, John Corabi who I worked with in Union, and I do my best vocals I can do. The record is a labor of love. KISS has been nominated for induction into next year’s Rock and Roll Hall of Fame class. If they make it, will you be there? Well, you know, I’m still a little confused, but my guess is that it may only be the original four members, who are still alive and kicking. You know the politics of KISS. I don’t know what to say. If it’s something where they wanna involve everyone who’s been in the band, then I’d love to. But I’m not waiting for the phone to ring. How would you characterize your 12 years with KISS? Well, look, there are certainly the KISS fans who are aware of the non-makeup era of KISS. Truthfully, those fans are very supportive of my era. They speak of the most important concert they went to, and I was playing guitar then. That’s very meaningful. They’re always supportive of albums like Crazy Nights, Hot in the Shade, Revenge. The MTV Unplugged recording in 1996 seemed like a great thing for the fans, and the six of you got to play some songs KISS rarely did. Given that’s what led to the reunion tour (with Ace Frehley and Peter Criss) and your KISS tenure ending, what was it like behind the scenes? Why haven’t we ever seen you in KISS makeup? Eric (Singer) was in makeup a couple times; ya gotta remember he went in makeup when Peter didn’t tour, then Peter came back and did the Aerosmith tour (2004). So that was kind of weird. You know, Tommy Thayer was working with the band behind the scenes, and he’s a fine guitarist, and it was very natural when Ace wasn’t going to show that it was like, ’Tommy, suit up. Ace isn’t going to be here.’ I can’t say that if I was asked that I’d say no, but I was never asked. I do miss my time in KISS, but I like my legacy being what it is for those 12 years that I was in KISS. You were at the KISS Expo in Los Angeles last Sunday, at a time when you were celebrating BK3, KISS had just come out with Sonic Boom, and Ace had just released his first solo album in 20 years. What kind of reaction and feedback did you get from those fans? Everybody’s excited because if you’re a KISS fan, there’s a lot to celebrate — instead of being the same ol, same ol. I did a preview (of BK3) and played a little of each song. I think it’s a great time for the KISS fans. And I’ll be celebrating at a lot of KISS expos. Just last night, I sent a message out to one in Belgium on Sunday that Lydia Criss is hosting, though I’m here in New Jersey. I think there will be a lot of KISS expos next year, and a few of those should be in the States. It’s not a good idea to have them while KISS is touring. Even though you are the longest continuously-tenured guitarist KISS has ever had, and you’re in your ninth year with Grand Funk, you’re always viewed as the new guy. Is that old or awkward for you? I try not to count like ’old guy, new guy, original guy.’ As long as I’m doing what I love, that’s what matters. The Grand Funk guys, we all really get along. I’m very grateful and thankful (founding member/singer/drummer) Don (Brewer) brought me in. It came together very quickly. As busy as you are with BK3 and Grand Funk, do you plan on catching any KISS shows on their tour? You know, it’s funny, before going to Australia in December for BK3, I’m doing some clinics in Europe in November, and I have to fly out the night they play in L.A., where I’m doing some work as well. But I’ll figure it out, and at some point I’ll go see them. With all the artists you’ve played with, who would be your dream bandmates you’ve never played with? To be honest, a few of those would be ones that passed away. John Bonham was an amazing drummer, and I would love to have played rhythm guitar with Jimi Hendrix. I would’ve loved to have backed up John Lennon. I got to play guitar with Roger Daltrey; I love The Who. I’m a big Cream fan. Unfortunately, most of the ones are not with us anymore. You and your brother Bob did an instructional DVD of KISS songs. Why haven’t you played together more often? It’s interesting you mentioned that. At the top of November, there’s a Meat Loaf DVD that’s going to be released, and Bob and I were the original guitarists on the Bat Out of Hell Tour (in 1977). It’s concert footage largely based on that tour, and they’re finally releasing that, so look for that. You know, Bob produces a lot of records and Christmas records. I do a lot of work with him in the studio but just never really had the time to do a full-on studio record together. But we do work together, and we’re really close. What’s your favorite KISS song and Grand Funk song to play live and why?